Few properties compare with Starborough Castle in Surrey. It is a perfect romantic retreat to fall in love with this Valentine's Day. Stroll along a snaking path, over a small footbridge with a spring-fed moat and the castle awaits. Surrounded by rhododendrons, willow and yew trees, there could not be a more tranquil setting. A robin sings a masterpiece with a song in his heart, while deer happily graze amid the property’s ten acres of landscaped grounds. Now for the first time in 20 years, this historic home is for sale. Behind an oak panelled door, treasures hide inside for romantic house-hunters: a coat of arms is emblazoned proudly on the wall, while gothic-bay windows bathe the interior with dappled sunlight though the trees nearby. “We have sold many unique properties from mews houses to multi-million pound apartments, however this is our first castle in 66 years. 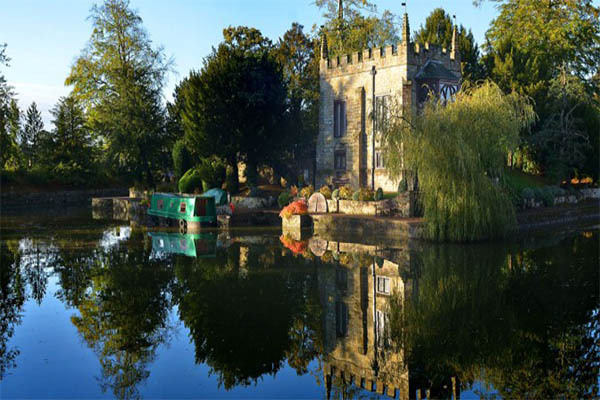 It is believed to be one of Britain’s smallest castles with one of the largest moats,” says Charles Sheldon, Senior Sales Negotiator. This is clearly no ordinary property. The diminutive Grade II* listed castle is so far from the madding crowd, that it could be in North Yorkshire or the Highlands of Scotland. The fact that the property is on the Kent-Surrey border, within easy commuting range of London, only makes it more appealing. You just don’t expect commuters to live in this kind of setting and Lingfield Station is about two miles away, with a 48-minute commute to London Victoria. There has been a castle on this site, near Edenbridge, since the 14th century. The present building dates from 1754 but, until it was restored in the mid-1980s, it had become completely dilapidated. High spots in its chequered history include a period in the Noughties when it hosted an annual jazz festival. To call Starborough easy on the eye would be the understatement of the century. Everything about the property screams romance, making it the ideal Valentine’s Day getaway. If the Gothic turrets and tranquil moat are not romantic enough, worthy of any fairy-tale princess, there is an exquisite miniature great hall with a bay window, next to a minstrel-gallery kitchen. What more could any love-struck couple ask for? A four-poster bed in the master bedroom? Check. A period fireplace? Check. Exposed ceiling timbers? Check. Gardens with a thatched summer house and gazebo? Check. Ducks gliding over the moat? Check. You ask for it, Starborough Castle has it. Perhaps the most charming touch, because it is so unexpected, like a prop that belongs in a different script, is the longboat that is permanently moored in front of the castle. It doubles as an extra bedroom, but is so pretty and unusual that house guests will feel as if they have found an even more romantic billet, lapped by the calm waters of the moat, than the castle itself. If Valentine’s Day doesn’t bring out the Romeo (or Juliet) in you, this deliriously romantic property surely will. Its charms are as timeless as love itself.